An overnight stay to explore all the attractions that the Victorian spa town of Harrogate and the grandeur of Georgian historic York. Staying at the Majestic Hotel, Harrogate with bed and breakfast and 3 course dinner. The definitive boutique spa town in the heart of Yorkshire. Its thriving streets buzz with the spa heritage which can be seen at every turn. 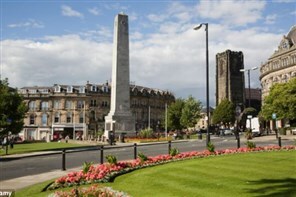 Possibly the most distinctive feature of Harrogate is its vast open space that surrounds the town centre, known locally as the Stray, at 200 acres this gives Harrogate town centre a green and spacious feel unique to the town. Born through a boom in Spa tourism during the Victorian 1800s Harrogate quickly developed a reputation for luxurious getaways for body and soul. The high society of the Victorian Britain flocked to Harrogate to enjoy the air, the space and the therapeutic spa treatments as well as taking the famous Harrogate waters. This reputation continues to be well deserved. Modern day Harrogate is the go-to destination for relaxation and indulgence, synonymous with quality shopping and afternoon tea - Betty's Teashop is a must! The Spa history continues to shape the town with several superb spas, including the original Turkish Baths in the iconic Royal Baths building in the centre of town. Harrogate is known for its floral excellence, evident in the magnificent displays across the town and in its well-kept parks and gardens. The largest of these is the Grade II listed Valley Gardens, which features several distinctive areas and receives 3 million visitors a year. To explore York is to explore 2000 years of history, from the ancient walls of Roman York to the Viking remains of JORVIK and the grandeur of Georgian York. Delve into Yorks heritage, discover hidden attractions off the beaten track, enjoy a vivid food and drink scene and wander in and out of contemporary independent shops. Offering more attractions per square mile than any other destination in the UK, youre never more than a short walk from one of York's awe inspiring offerings. Plus, the citys varied and vibrant calendar of events and festivals means there's always something just around the corner. Whether you want to take in the majesty of the iconic York Minster, marvel at masterpieces at York Art Gallery, experience the thunder of galloping hooves at York Racecourse or discover the citys grisly past at the York Dungeon, theres an attraction to suit everyone. If youre only in York for a short time, make sure to tick these must see attractions off your list! Staying at the Majestic Hotel, Harrogate. With 3 course dinner (choice of menu) plus breakfast. We depart the West Country and make our way to Harrogate where we check in for our 1 night stay for dinner, bed & breakfast. Free time to explore the delights of Harrogate. After breakfast we check out of our hotel and you'll enjoy a short scenic journey to York. Free time in York to depart 4.30pm to arrive home early eavening. A palatial and stately Victorian property, The Majestic Hotel is a Harrogate landmark, set in 8 acres of private gardens in the heart of this elegant spa town. Built at the height of Harrogates prosperity in the 19th Century, The Majestic Hotel is a grand, opulent base from which to discover the towns many fine buildings, excellent shops and beautiful parks and gardens, or head out into the magnificent Yorkshire Dales National Park.